Update: Printable shopping lists are ready! Click HERE to see the corresponding shopping lists for this menu! Here it is! 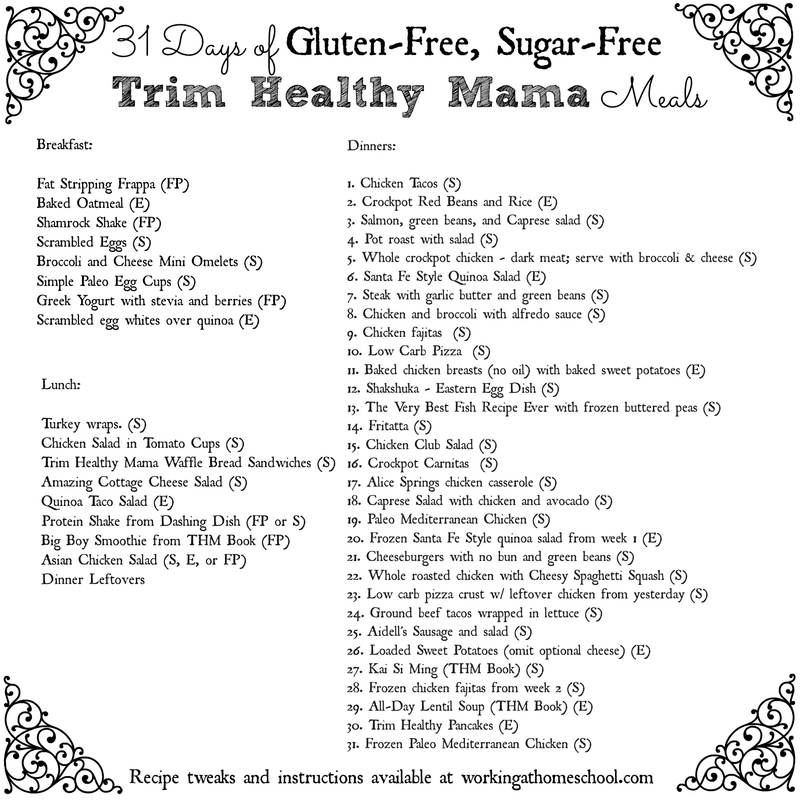 Another 31 Day Trim Healthy Mama Menu! The corresponding shopping lists aren't ready yet, but if you follow me on Pinterest, Facebook, or on this blog I will let you know when they are available! I'll also have all of the linkable recipes pinned on Pinterest in the next few days. Many of these meals are Paleo-friendly, and they are made with whole, healthy foods. Trim Healthy Mama is definitely the way to go if you want to avoid pre-packaged foods! These 31 day meal plans reflect my once-a-week-cooking style. I used to try to do the huge, once a month cooking sprees, and while I loved the idea I just don't have the time! I work at least 30 hours a week while homeschooling, and I found that once a month cooking just stressed me out. Instead I started doubling up on meals once or twice a week. That way I have food in my freezer, but I'm not overwhelmed with tons of prep, hours of cooking, and then clean up. The link to the printable meal plan is at the bottom of the post – thanks for stopping by! Broccoli and Cheese mini omelets -(S) these freeze well! Chicken Salad in Tomato Cups (S) – if this seems like too much effort for lunch, sometimes I just skip the tomato altogether. Low Carb Pizza crust w/ ground beef and sausage, sugar-free pizza sauce, and cheese (S) ** This makes one small/medium pizza depending on how thin you spread your “dough”. For us, it's easy to just cut six slices and give one to each person, then fill up with a salad on the side. Don't forget to check out 31 GF/SF Trim Healthy Snack Ideas. 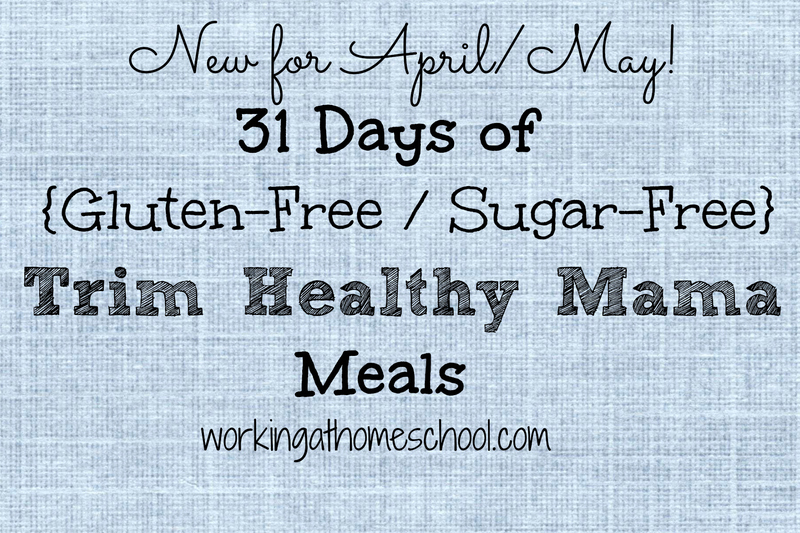 And if you need more meal ideas, I have last month's 31 Days of GF Trim Healthy Mama Meals posted HERE. *I wrote out the tweaks and ideas for you. Since some of the recipes are not THM compliant as written on their original links, please look carefully! *Sometimes I find that I feel like an S, but I've planned an E. Or the other way around. This isn't a hard-and-fast THM menu, because THM is so flexible! Please make sure you read the book and adjust the meals or meal order to fit around your tastes and needs for weight loss or maintenance. *Please check and re-check all ingredients to make sure they are gluten-free! *I repeat my breakfast and lunch menus throughout the month. It's just enough variety for me, and I honestly don't mind repeating some meals, as long as there is more variety at dinner time. I also find that it's cheaper to have the staples on hand for breakfast and lunch ideas instead of a long list of 31 different breakfasts and lunches. Printable link ————> 31 Day Printable Meal Plan<——— Printable link! « An Easy Plan for Keeping Homeschool Kids’ Snacking Under Control! Sorry if you’ve answered this already. I looked all around your site and didn’t see it. How many people does your shopping list/Dinner meals typically feed? Good question! 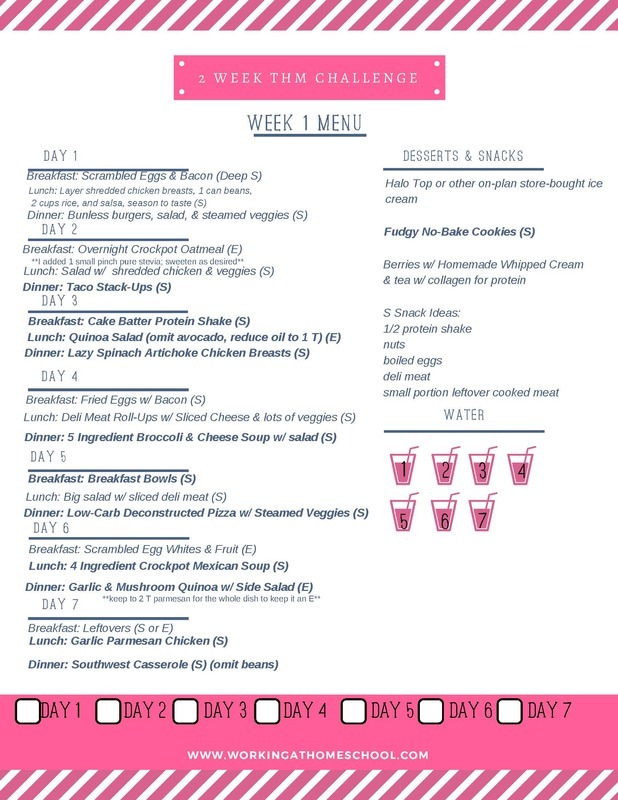 The shopping list on the last menu (https://thewellplannedkitchen.com/2014/03/22/31-days-of-gluten-free-trim-healthy-mama-meals/) is for a family of six, and I specify when recipes are doubled or halved. There is no shopping list ready for this menu yet, so you’ll need to check each recipe here if you go shopping before I have the shopping list posted. Most recipes feed 4-6, but a few feed 2, so it’s good to keep an eye out! Sorry I don’t have the shopping list for this menu available yet, but I’m working on it now! I don’t see the recipe for the E Quinoa Taco Salad? I’m so sorry, I had to delete that one from the menu because the recipe link stopped working. I don’t know if the original author removed the post, or what happened. I reposted a new version of the menu without that included. The Santa Fe Quinoa Salad for dinner is a great lunch leftover that is sort of similar. I’m making the pot roast tonight, and I notice it’s labelled an S, and it contains carrots. How many, if any, carrots should I eat with it? Good question! The THM authors say “a few” cooked carrots are ok in an S setting. I avoided the full serving, and just ate several pieces of chopped carrot with my roast. I’ll update the post to include that info; thanks for bringing it up! Thank you so much! We are really enjoying the meals. I’ve never cooked a roast that way before. It was excellent, and the veggies were perfect. Both hubby and son loved the carrots! Next time, I’m going to add in some radishes for me. I’m glad you liked it! I LOVE this pot roast recipe; it’s a family favorite and it’s great to find recipes that don’t need any tweaking for THM. You are so sweet! Thank you so much for your kind words! I am so happy to know that some people are helped by this. I know menus and meal plans can only go so far with THM, because someone else might need to incorporate more or less of certain types of meals, but I hope to at least spark some ideas! Thank you for your encouragement! What do the letters mean after the recipes? Thank you, I’ll take a look at the book. Could you please write in a darker color….cant read your green writing or links….thank you for your menus and shopping lists…blessings. Unfortunately, it took hours of work to make these and I’m not able to re-do them for you right now. There are lots of other meal plans and menus if this one doesn’t work for you. I’m sorry for the inconvenience! I’m a busy homeschooling mom of 5 and this blog is a labor of love for me, but I promise re-doing this is on my to-do list! Lots of people have said that they can adjust their computer monitor and see it better. I just stumbled on your blog and am over the moon excited. I have been on and off THM for some time now. It works and I want to stick with it. But I am a working And homeschooling mom, with a food-allergy kid. I just don’t have the time or energy to always think ahead and through meals to be THM and allergy safe. We prefer to eat whole foods. Your menu plans are a answer to pray. I dont kmow how you fo it all. Thsnk you for sharting. Thank you for time and energy. What a blessing! I’m so glad you’re finding something helpful here! I have those times where I start to go off-plan, but it’s so worth it if you can push through and stick with it! I hate having to detox and go through sugar cravings all over again. Is there anyway to make this a little more organized? For example, use a calendar to put the meals on each day and then when you click on each meal it goes directly to the recipe link? Maybe then only have 1 other document for the shopping list? It gets confusing using the #’s and matching them to the shopping list each week and then going back to find the corresponding recipe for each. Is the Overnight Baked Oatmeal and E? When I was makig it and adding the coconut oil and the eggs the fat seemed a little high for an E meal. Still trying to learn the THM system and want to AME sure I am sticking to plan. Thank you for all your hard work. You make my life so much easier.